At BuyBrandTools.com our aim is to supply the best quality brand tools directly to professional users at the lowest prices. We strive for complete customer satisfaction and welcome feedback from our customers to help us to continually improve our service. We refuse to sell inferior tools, manufactured with little regard for quality and durability. We specialise in supplying tools for the tiling, scaffolding and surveying sectors. 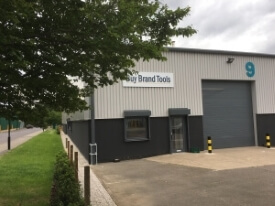 However, our strong position in the tool market allows us to supply tools and equipment to many more sectors and we aim to continue to expand and diversify. Dedicated Sales Support - Experienced sales advisors, based in our Sheffield offices. NO automated systems! Satisfied Customers - Read our customer testimonials & 34,000+ eBay feedback! Worldwide Reality Solutions (WRS) Ltd was formed by the directors of another successful tool company, each with over 20 years experience in the UK tool industry. The company subsequently changed its name to BuyBrandTools Ltd in 2017. The original version of the BuyBrandTools website was launched, offering a small selection of scaffolding tools and Leica Disto laser distance meters. BuyBrandTools.com was completely re-developed, re-branded and re-launched. The product range was expanded greatly, including the addition of Rubi tiling tools. The BuyBrandTools eBay store was launched and it opened up a whole new audience for our products. The company continued to grow, with new members of staff being employed to help deal with the increasing marketing and admin workload. 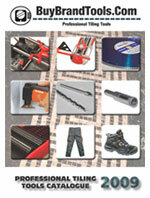 The BuyBrandTools tiling tools catalogue was launched to an enthusiastic response from tilers. All copies of the catalogue had been claimed within just a few weeks of it being printed. Version 4 of the BuyBrandTools website was completed, with an increased focus on graphical navigation and collapsing menus to help enhance the user experience. Major changes were made to BuyBrandTools' order processing system. This enabled us to deal with orders and enquiries in a more efficient manner. BuyBrandTools also partnered with Trustpilot - a leading independent customer review service. Social media channels were added to BuyBrandTools - allowing customers to easily "like" us, "follow" us and connect with us on Facebook and Twitter. Version 5 of the BuyBrandTools website was launched, with a focus on improving the user experience for users of mobile devices. The internal company system was upgraded to SAP Business One. This allows more customer orders to be processed, more efficiently. The next generation of Rubi manual tile cutters launches on our website: TS-MAX, TZ, TR-MAGNET & SPEED-MAGNET. With even greater power and state-of-the-art features. Buy Brand Tools partners with ProWarm - a market-leading supplier of electric underfloor heating. This marks one of the biggest new product ranges added to the website for several years. BuyBrandTools is proud to work to a number of quality standards to help ensure the satisfaction of both customers and employees. BuyBrandTools works in line with (although not currently accredited by) the ISO 9001 quality standard to help ensure the effective management of the business and of customer requirements. We comply with and are accredited by the Payment Card Industry Data Security Standards (PCI DSS) - a set of comprehensive requirements to help ensure that customer card details are kept safe and secure. BuyBrandTools manages employees in line with (although not currently accredited by) the Investors in People standard - the UK's leading people management business improvement standard. We have recruited a number of students through the Sheffield Hallam University undergraduate placement scheme and are committed to supporting and developing the skills of those students.